The quintet of abstract painters sharing this space use distinct techniques that complement one another’s work and ultimately amplify the impact of each individually. 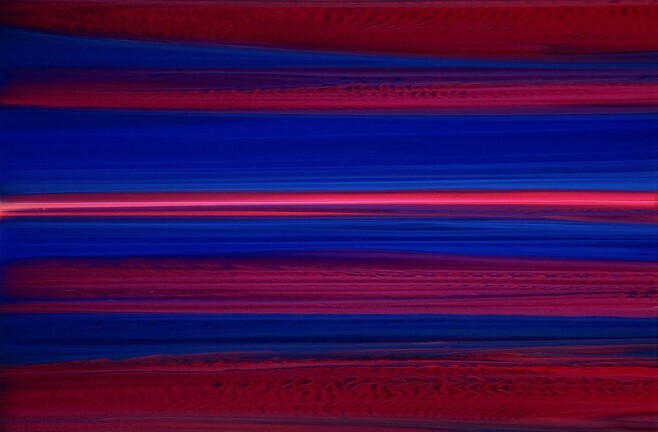 The compositions of Andy Moses and Linda Touby share a motif of horizontal bands of color. Touby’s thick swaths of primary and earthy hues come together in rough edges that reveal distressed layers. This ongoing series, titled “Homage to Giotto,” evokes the texture of eroding frescoes. In contrast, Moses (son of Los Angeles painter Ed Moses) applies aerospace paints in thin strokes to create subtle gradations of color that achieve a shade-shifting effect, especially on the concave surfaces of Departure at Dawn (2007) and Nocturne Latitude 20 30 03 (2008). While those works hint at aeronautical views, this subject is treated more literally in the fluorescent-tinged paintings of Florian Depenthal, a German glider pilot. Some of his paintings’ vertiginous angles and mysterious forms are inspired by his airborne perspectives of the earth’s planes and by everyday shapes distorted by distance. His recent bright canvases give way to the dark, moody 1995 gem Fellow Conspirator, which is tucked into a back corner to allow for solitary contemplation. Michelle Concepción paints mysterious dreamscapes resembling blood platelets enlarged under a microscope. A video documents how she delicately drips semitranslucent acrylic pigments onto canvas, letting the biomorphic blobs change color as they drift across one another in ever more layers. This engagement with the accidental contrasts with Aaron Karp’s optical illusions, exuberant works featuring celestial shapes overlaid with painted screens that look like raised rectangles. The resulting wavy grids make the saucers and stars in Cuchara Dancer (2004) and Dry Smokey (2004) appear three-dimensional. This smartly curated show lets each artist shine individually while highlighting the subtle connections linking their diverse styles.